by W.Bro. Yasha Beresiner [see short biographical note after lecture], Past Master (1997/8), Quatuor Coronati Lodge No 2076 (Premier Lodge of Masonic Research) (Reproduced by kind permission of W.Bro. Beresiner). Transcript of a lecture first delivered on the occasion of the 250th Anniversary Meeting of the Enoch Lodge No XI, UGLE. I know a number of Masons that would place a good bet that if the missing minutes of this Antients Enoch Lodge No XI, were they to be located, would establish that Laurence Dermott, that most extraordinary freemason, had at some time been a member, or at least, have several times attended Enoch Lodge. You really cannot speak of the Antients without closely linking that Grand Lodge to the name of Laurence Dermott. It can be unequivocally stated that if it were not for Dermott there would have been no Antients Grand Lodge. If not for Dermot the whole structure of our Lodge and ceremonies would have been different. If not for Dermott we may very well not have had the opportunity to stand here this evening celebrating this very special occasion. There are just a handful of men in the annals of freemasonry who can genuinely be seen as unique and extraordinary: I speak of men whose influence changed the face of our Craft men such as Elias Ashmole, Thomas Dunckerley and in particular for this lecture, Laurence Dermot. Whilst Dermot’s fame and activities revolved around the Antients Grand Lodge, the Royal Arch, somewhat indirectly, played a very significant part in his life and Masonic activities. Laurence Dermot was born in Dublin in 1720 and initiated in Lodge number 26 in 1740. Six years later he was the Master and that same year, in 1746, he is recorded as being a Royal Arch Mason. One of the earliest references we have to the Royal Arch. In 1748 he came to England a poor man and as a journeyman painter joining a Moderns Lodge but very soon transferring his allegiance to the Antients. He was received in Lodge No 5 (now Kent 15) and then number 10 Lodge (now Royal Athelstan 19). These were difficult times for Freemasonry in general in England. The Premier Grand Lodge, top heavy with aristocrats and even members of Royalty, was being neglected. Dissatisfaction was wide spread and a minor incident finally broke the camel’s back. As recorded in the minutes of the Grand Lodge of England, on 11th December, 1735 the Master and Wardens from a Lodge under the jurisdiction of the Grand Lodge of Ireland were refused admittance to the Quarterly communication of Grand Lodge. To the Irish, this incident was a major confrontation especially in the light of Irish Brethren often being denied membership in English Lodges. There were, by 1750, several exclusively Irish Lodges and on Wednesday 17th July, 1751 five of these Lodges finally joined forces as a General Assembly referring to themselves as a Grand Committee with a view to forming the Grand Lodge of England according to the Old Institutions. They recruited Laurence Dermott who, within a year of the establishment of the new Grand Lodge, replaced John Morgan as Grand Secretary at the meeting on 5th February 1752 at the Griffin in Holborn. All the information and references available on Dermott are based on the minutes he himself kept of Grand Lodge affairs and in the first book of constitutions of the Antients, Ahiman Rezon, which Dermott wrote. From the start Dermott made his presence felt and took a grip of all aspects of the affairs of the Grand Lodge. There is no question that he was genuinely and totally dedicated to the welfare of the Antients Grand Lodge. The structure of the Antients suited him very nicely in those early days. Whilst awaiting the acceptance of some member of nobility before electing a Grand Master, Grand Lodge worked as a Grand Committee with the Grand Master on a rotating basis selected from one of the Worshipful Masters of the Antients Lodges. This gave Dermott immense power to control all aspects of the affairs of Grand Lodge. It continued until 27th December 1753 when Robert Turner was installed as the First Grand Master. It may be going too far to state that Dermott may have intentionally delayed the appointment of a noble Grand Master. Such action, however, would have allowed him to maintain his hold on the Brethren, fearing that a Grand Master might weaken his own plans for the new born Grand Lodge as well as his standing as Grand Secretary. The power Dermot exercised was soon in evidence in the minutes of the Communications. In July 1752 two Brethren, now nicknamed by Dermott ‘Leg of Mutton’ masons were expelled from Grand Lodge for illicitly making Masons for the price of a leg of mutton. In September 1752 at the annual Installation of the new Grand Master – there being no Grand Master or Grand Wardens yet appointed – Dermott appointed himself as Grand Secretary ‘according to ancient custom’ and he then proceeded acting as Grand Master and investing the Grand Officers of Grand Lodge. It is not surprising that there was considerable dissent and antagonism toward this strong character and it occasionally surfaced in Grand Lodge. On 6th December, 1752 Dermott produced an old Manuscript and continued at great length explaining its content and importance. At the end of a very long session a motion was made to thank and praise the Grand Secretary, when four Brethren stood in protest and one of them declared that far from being of any interest the long lecture had caused the Brethren to loose their senses. Dermott was allowed to respond and began by saying that if he were given the opportunity to speak he would gladly sing all the brethren back to their senses. He was granted permission and continued for another hour. It was, however, in 1756 that Dermott really excelled in his standing as a dedicated Antients freemason. This was the year of publication of the Antients Constitutions named ‘Ahiman Rezon’. The meaning and transliteration of the title still remains a mystery. Dermott was, however, very aware of the youth of his own Grand Lodge and that there was little room for an historic introduction of subsequence. In his introduction to the Constitutions, therefore, he proceeded announced that he really felt little need to follow in the footsteps of those who wasted time in irrelevant historical introduction. He did however compose and write a relevant and important introduction to which he wished to incorporate a summarised review of all the available information from other sources but found the material so boring that he fell asleep whilst reading it. Now he had a wonderful dream of four Sojourners from Jerusalem approaching him, praising him for his work and the material written so far and advising him on matters to add to his manuscript, when he was abruptly woken up by his puppy dog running around the room and under his feet whilst chewing the last pages of his manuscript. He apologised, therefore not to have an historical introduction and went straight on to attacking the Premier Grand Lodge of 1717. Dermott needed to justify the formation of a competing Grand Lodge and he did so by attacking and attempting to diminish the standing of the Premier Grand Lodge. He quickly hooked on to the idea of the Premier Grand Lodge have deviated from the Land marks of the order and this continued as his theme whenever we come across his comments about the Premier Grand Lodge. They did not recognise the Royal Arch – join the Antients and we will make you real masons. They changed the first and second degree words and signs to supposedly protect the Brethren from the profane who were gaining access into Masonic Lodges as a result of the publication of a series of exposures after 1730. The Antients planned to revert to the original sequence. They de-christianised the Order by eliminating references to the Trinity in their Constitutions. The Antients would revert to a Christian Society. Much of this, however, was just rhetoric. 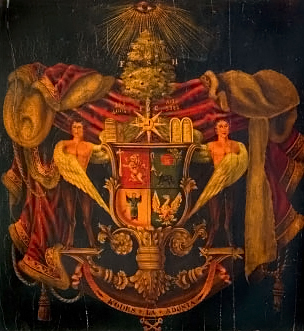 The 1756 Constitutions overtly included prayers for Christian and Jewish Lodges and the attempts of Dermott to establish the Royal Arch as a fourth degree were frustrated in 1766 when the members of the Moderns Grand Lodge formed the Supreme Grand Chapter under whose authority we still meet today. Dermott began to suffer from gout and we are constantly reminded of his problems with health. None the less he continued in his aggressive and cantankerous involvement with the Antients to his dying day. He won every argument brought forward. In June 1671 he was honoured in Grand Lodge and saluted with 5 and claimed that he should have been saluted with 3. Following that argument he proposed formally that the number of the salutation given to any Grand Officer should be at the discretion of Grand Lodge and the Grand Master. Following a brief discussion he was saluted again 39 times . . . as it happened to be his 39th birthday! All recorded in the minutes. In March 1771 the 3rd Duke of Atholl appointed him Deputy Grand Master after serving nearly 20 years as Grand Secretary. In 1783 he was again appointed Deputy Grand Master and continued until 1787. My last image of Dermott is in March 1789 still active but now totally unfit with swollen legs that prevented him from walking; nonetheless he attended Grand Lodge for the last time . . . carried in on the shoulders of two Grand Deacons. Was it foresight that had led him to establish the Office of Deacon when the Antients were first formed? Dermot died in June 1791 and we still do not know where he is buried. As I said Brethren, an extraordinary Man and Freemason. A .pdf copy of the above lecture (text only) can be accessed through the following link "Laurence Dermott: Extraordinary Man and Mason, by W.Bro. Yasha Beresiner". Short biography of W.Bro. Yasha Beresiner.